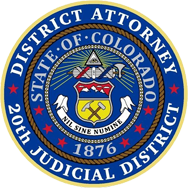 The County Court has original jurisdiction over all Colorado state misdemeanor and traffic cases. One Deputy District Attorney is assigned to each of the Boulder court divisions. In the Longmont courts, two Deputy District Attorneys are assigned to prosecute the Longmont caseload. When a Law Enforcement Officer believes that a suspect has committed an offense, the officer will either issue the individual a ticket, which is formally known as a Summons and Complaint, or arrest the suspect. If a ticket is issued, an Arraignment date is noted on the ticket and the suspect must attend Court on that date. If a person is arrested they are taken to the Boulder County Jail, where a Bond Commissioner reviews the case. If it is allowed by statute or local rule, the Bond Commissioner or the on-call judge may set a bond with appropriate conditions. In certain cases, such as an arrest for a Domestic Violence offense, no bond is set until the case is reviewed by a judge at the next available court date. At the next court day following an arrest, the person is brought before a judge at the jail for a review of the bond and the setting of an Arraignment date. If a person posts their bond before they are seen by a judge at the jail, they are released and given a date for their Arraignment. If a person does not post bond, the Court will set a Pretrial Conference date within a few days of their first appearance before the judge. At the Arraignment, defendants appear in court to answer the charges that have been filed against them by either entering a guilty plea or not guilty plea. In many cases, the offender will meet with a member of the District Attorney’s office to discuss the possibility of resolving the case on that date. If an agreement is reached, the Court will review the agreement and decide if it will accept the Defendant’s plea of guilty and the proposed agreement. If a guilty plea is entered the judge or magistrate imposes a sentence and the case is closed pending the defendant completing the sentence. If a not guilty plea is entered, the defendant and/or an attorney for the defendant returns at a later date for a pre-trial conference. A pre-trial conference is an opportunity for the defendant and/or an attorney for the defendant to discuss their case with a Deputy District Attorney. Following this pre-trial conference, the case is either set for a Disposition in Court so that a guilty plea can be entered, or is set for a different court hearing called a Case Management Conference (CMC). Cases that are not resolved at the Case Management Conference are then set for Trial. Since the County Court Division prosecutes thousands of cases every year, the majority of cases are resolved without a trial. Therefore, plea negotiations often occur between the defendant and the Deputy District Attorney to see if a plea agreement can be reached to resolve the case. Many individuals choose to resolve their cases in this manner because they believe that they will be found guilty at trial or because they find the agreement to be a convenient way to conclude their case. However, if a Defendant desires to challenge the charges they have the right to a trial. If a defendant is convicted at trial, the Court has all sentencing options available based on the convicted charges. Generally, plea agreements involve a guilty plea to a reduced charge or a guilty plea to an original charge with a stipulation regarding what sentence will be imposed. To best ensure that appropriate plea agreements occur, the District Attorney’s Office evaluates each case based on many factors including, but not limited to, the seriousness of the offense, any input from the victim that has been received, community safety, and an analysis of any prior history each offender may have. Plea agreements can occur at any stage of a case and are subject to a review by the Court and a decision to accept or reject the agreement. The most common cases in County Court consist of traffic charges and Domestic Violence matters. In most cases, first time offenders who are not involved in an accident, did not cause an injury to another person, and whose blood alcohol content is below a certain limit will usually receive a sentence to Probation with fines and costs, community service, a requirement to submit to an alcohol/substance abuse evaluation, and must follow through with treatment recommendations. Conviction of a second or subsequent DUI/DWAI offense generally results in more significant consequences for the offender. In Domestic Violence matters, any resolution requires Domestic Violence treatment. Other appropriate sentencing conditions, such as jail time, may also be imposed depending on an evaluation of the case.